Malik-e-Maidan is the prime attraction in Bijapur which houses world’s largest medieval cannon in it. The name means “The Monarch of Plains”. Canon is huge and weighs 55 ton. Its length is 4 m and diameter 1.5 m. Worlds Largest Cannon belonging to the medieval period placed on a specially made platform on a lion gate called as the Sherza Burj in the local language. The cannon is supposed to have been transported all the way from Ahmednagar as a trophy of a 17th century war. 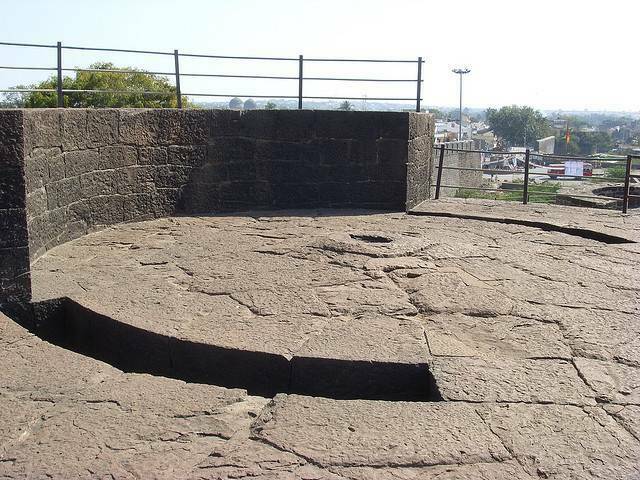 In 17th century, the Adil shah Sultan brought this cannon from Ahmednagar as a symbol of victory. Nearly 400 oxen, 10 elephants and tens of men helped to transport this canon to Bijapur. The nozzle of canon is made like a head of lion. Men after shooting the canon used to hide under water in tank in order to avoid the deafening sound produced by canon. Inspite of being exposed to hot sunlight, tourists can feel chillness when they touch the canon. The sounds like a bell when tapped.